Discover in this expansion six unique sets of ships: interceptor, frigates, cruisers and stellar bases. Specially designed for the alien races of the game Eclipse. This box also contains a new platter combining Terran and Magellan Guardians, a player order order track, as well as additional tiles. This expansion can not be played without the Eclipse base game. Be careful this game is an extension of Eclipse and cannot be played alone. 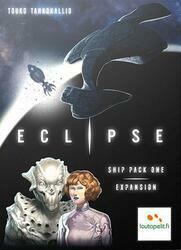 To be able to play it you must have a copy of the game Eclipse .